All that you have to do is to write your short message to Rena via this article comment form. – We will filter out your messages to avoid profanity or insult and then compiled all messages and print it out for Rena. We will not print your email address, the one that you will need in order to reply to the comment form nor we will open up your email address to any third party. – This is a non-profit project, so rest assured, you will not be charged any kind of money. I will deliver it to the theater directly by printing out your messages. I will talk about it at the AKB48 Handshake event on either the 8th, 9th, 23rd of September and 19th October. I have reserved Rena’s Handshake ticket for each date and I will then report to you guys after that, about her impression and many things. Application is now closed! Thank you very much for your letters and messages. Please do wait a while for further updates! I’m Japanese. I like Indonesian people, culture, foods. My favorite Indonesian food is Mie Ayam. I translate and introduce Akicha's activity to Indonesia and the world. Heya Rena! How’s your days in AKB? I hope everything is going smoothly. We gonna miss you a lot here in Indonesia. As usual, Jakarta is still the land of traffic jam and uhm..well..the Nasi Goreng is still tasty as usual too. Kopitiam is still the place where the fans hanging out too in f(X). Not a lot of things happened during this month and Jakarta is still the same ‘ol Jakarta you knew. That being said, do your best in AKB Rena! Show ’em what a Jakarta girl can do! So, bottom line, GANBARENA !! There is nothing you aren’t able to do, so just face every obstacle with your hardwork and keep smiling ! Hey Rena~ So… ermmm… How’s it going in Japan ? I’d like to say one thing, please do your best in AKB48 just as much, actually even more than you did in JKT48. In AKB48, you won’t just be “Rena” but JKT’s “Rena”, so everything you do there will also impact the image of JKT48, eventually. No pressure… Now that you’re in AKB48… you should aim to be CENTER xD. No, seriously, cause you can at least become center through the Janken competition, right ? Hello Renakuma, I actually kind of confused on what to write/tell to you. Our cute renakuma who had spend and share so many with us, JKT48 fans. Rena, jangan lupa balik ke Indonesia, ya! Hi Rena, I was there the night you told us that you’re going to Japan. I was quite shocked, I thought about it for several days. You were always there, on the stage, in all RKJ stage I watched until today. I believe the next time I watch RKJ, it will be different without your presence. Nevertheless, you are still young and very potential. I believe you can improve more and faster in AKB. Keep growing and improving, share your knowledge and experience to the members here. Message : apa kareba Rena-chan ? . Message : Ganbarena! tapi…tapi..tapi…tapi jangan nyantuk! Hai Rena!!! I miss you! >.< Kangen Rena! Rena kangen Indonesia? Ayo datang lagi ke sini! Semoga sukses ya di AKB! Bisa ikut singlenya! Semuanya disini mendukung Rena! GanbaRenakkuma~! By the way, since the double team status will made you stay in Tokyo often more than in Jakarta, I just want to sent my best personal regards to you. I haven’t go to theater to watch ur performance in JKT48, but I promise, someday I will go to Tokyo to see ur performance in AKB48 Theater. You were the first member that attracted me to 48 Family culture. Thanks a lot for that! Hi Rena-san, how does it feel to be back to your homeland? It must’ve feel weird after being abroad for so long. Rena chaaaan, kumaha damang? i’ve been following you since your debut with JKT48 and now you’ve become JKT and AKB member iin the same time, it feels great to came home to your homeland isn’t it? even though it’ll be more harder for me to see you again because you’ll be staying more often in Japan, but i’m so happy that now you’ve become a great, adorable iidol. i’m so proud of you rena chan. i think this is a new start for you to shine brighter than before. no matter what team you’ll belong in AKB, i’ll always support you. ganbarena! I still can’t spell correctly my feeling after your return to Japan. Sadness and worry still shroud the bigger part of mine while happiness still flickers with some warmth of hope for your brighter future. Yet, I do understand that the sadness part sprout from my ego, while happiness sparked from my true care for you. I am sure that over time joy and happiness will overcome the darkness as you forge ahead toward your dream. I am looking forward for the days where you shine brightly on those stages across the sea. Whenever you feel the burden of your idol life weigh beyond your strength, please take a short break and and remember many people across the sea that cheer and love you warmheartedly. Even though distance separates us, you will still be our beloved Rena-chan. EDIT: my Japanese is kinda poor tho. Please spell-and-grammar-check my message before sending it to Rena, thank you! Hi Rena-chan, howdy? All of us really really miss you after your transfer to AKB. Although our hearts may be shattered , at the same time we are also glad as this will definitely be a step forward towards your dream. I hope you enjoy your time there and please make us proud as you now represent JKT48! I wish you all the best and do not forget that we, fans, will and definitely always support you! Ganbarena! Hi, Rena-chan~ long time no see.. But it’s feel short tho cause I always could see u on tv program and video lately, lol. (contd)…answer their hope with your best hard works and smiles, okay? Please don’t skip any meals and take care of your health. hello Rena, I am not the fans who used to come to the theater. but once you move to japan, i know JKT48 will seem less colorful. but don’t hesitate. 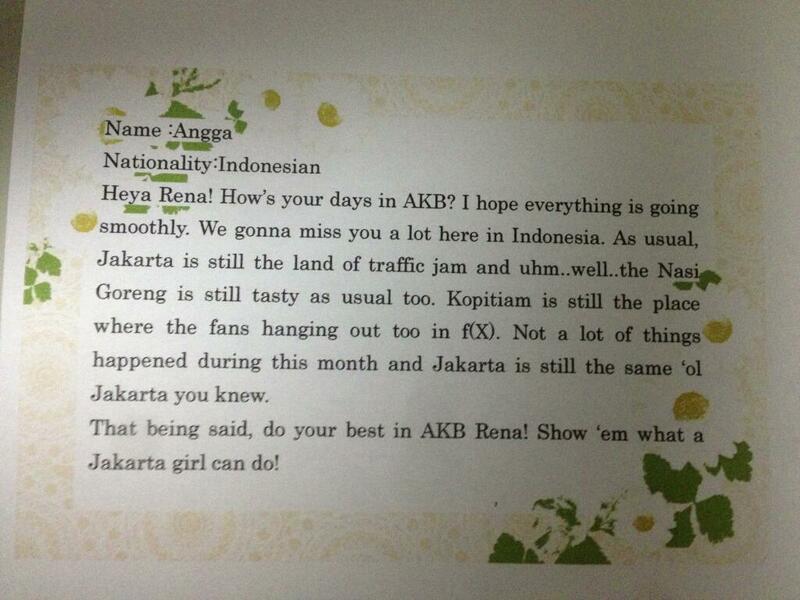 just concentrate in AKB, just like you usually did in JKT. And don’t afraid of loosing fan *giggle , as long as you keep tweeting, we will not forget you. Janken tournament soon will be held. I pray you get in Senbatsu, or even a CENTER. Go for it Sweetgirl! sorry.. accidentally push submit before writing this ^^! Definitely gonna miss you! I’m keeping this short because I know you’ll still come to Jakarta, so yeah. I’m wishing you good luck in whatever it is you do in Japan. But to be honest, I don’t think you need a wish of luck at all, I know you’re capable of anything as long as you work on it. But anyhow, good luck. Hi Rena-chan? Kumaha Damang? Pie kabare? Jangan bingung lagi kalau naik kereta di Jepang dan ati-ati neng ndalan yaaa (hati-hati di jalan yaaa). Selalu GANBA-RENA yaaa ! Kami no shukufuku, Rena-chan ! Hello rena-chan! I’m vey sad when I hear you’re going back to japan. I made a vow to myself that I’ll go to japan and watch your performance, wait for me okay rena-chan ^^ keep smiling and do your best! Ganbarena! Ganbarena! From JKT48 fans in South Borneo! Don’t forget to visit Indonesia again yo! We all miss you. Rena, I was fortunate to have had the chance to watch your theater stage performance back in May. Even if it was only once, I had the impression that you would do well should you move to Japan and perform with the Japan 48 groups. I know how it feels to move abroad and having to leave your friends behind, but I hope you will realize that the friendships you make will last a lifetime. We will continue to support you as best we can from overseas, so I hope you will also do your best to succeed in Japan as you have in Indonesia. Félicitations pour être transferrée aux AKB48. Sois la star là au Japon, inspire les gens – notamment les filles – avec ton esprit et ton souris. Je suis fier de toi, et je sais que tu ne nous decevras jamais. Sois toujours la star, inspire les gens – notamment les filles – que rien n’est impossible. De plus, sois toujours la Réna que nous connaissons, une fille brillante avec perfection et énergie. Nos souhaits et nos prières seront éternellement t’accompagneront. Hi Rena! I’m not a regular theater attendant. But almost everytime I watched theater, you always catch my eyes with your unique way of speaking, especially while MC-ing. Now you’ve gone to Japan (though in concurrent position), I think JKT48 theater will lose a bit of your charm. No need to worry though, because I’m sure your presence would add another charm to AKB48. And I’m sure you will be the perfect member to help bridging JKT48 and AKB48. Never lose your spirit, Renakkuma! GANBARENA! P.S. : maybe you could take a 2shot with my SKE oshi, Jurina Matsui? XD Hopefully you'll make it to the AKB newest single center by winning the janken! We'll send our luck from here lol GANBARENA!!! Rena-san congratulation for your transfer to AKB48 . . . I hope you doing well in AKB48. Just like Takahashi Manami`s words “Work hard will be rewarded!”. I also will work hard in chasing my daring dream and as a fan of AKB48GROUP. I hope in the future you and AKB48 member could come to Malaysia and perform some song. Until the time comes, I will be waiting here . . .
It’s just like a dream huh? When you join with AKB 48. shuyaku de iyouze. Please, be the best ever! I believe in you like i belive with myself. It’s just like a dream huh? When you join with AKB 48. Sore tte kiseki. Please, be the best ever! I believe in you like i belive with myself. “I was planning to visit JKT48 Theater when I heard you would back to Japan. That’s the worst news about JKT48 I had ever heard since I started becoming your fans. Visiting Japan is more difficult than visiting Indonesia because I’m in Vietnam. But don’t worry, I’ll try my best to see you in AKB48 theater soon. I really want to see you with Oshima Team K. Don’t worry so much about your debut. You can do it. And you will be the best. You should believe that. Your fans always stay by your side. Just smile for us and everything will be ok.
Hi,you just write your name and message for Rena(English or Indonesian is better). Message is 5line or so is best.Because too long message can’t print on card or very small letter to write that. Nationality and twitter address are optional,if you care no need to write about that. 1st comment(Angga)is our staff.Please refer to that. I hope you’re well there in Japan, in AKB48. I went few times to watch JKT48’s theater and you happened to be always performing when I watched it so I already grew familiar to you. I was so shocked when I knew you were about to move back to Japan permanently this time and I became so sad because of that. I missed chance to HS with you when you were still in Jakarta but I hope I can do it someday in the future. As a JKT48 fan as well as an AKB48 fan, I’m so proud of you that you can continue being an idol although I’m sure it is rather hard at the first try. Don’t worry about anything and keep striving because you have so much fans that believe in you. I am myself will try my best to support you because all JKT48’s members are precious to me. so Rena, do your best in your new Team and I’m looking forward to see you perfoming with them! how are you? I really miss you rena-chan..
want your dream to be a writer, I also wanted to be a writer. Because I’m going to support you because I want to be your small bear. Thank you because JKT48 already made ​​an appearance more beautiful. I hope you read this letter … Believe in yourself, You can certainly ….. once again THANK YOU #GanbaRena! Hi Rena! Gimana disana? Baik kan?? So.. You’re in Japan right now. A lot of people, even until the time you read this letter, will still miss you. We, Indonesian fans, think that you have left a lot of impression in our hearts. So please, do your best at AKB48! With Akicha-san too, please spread JKT48’s name all over Japan! And also, do your best at school too! Education is important! i miss you…No, we all miss you. i hope you’re okay in there. Team K of AKB48…wow, congratulations Rena swannn. well, i like to drawing, maybe sometime i will make picture of you wearing a Kebaya. Hi Rena!! I’m sorry for not having been able to go see you in Jakarta, although I’m twenty years old I am quite useless and haven’t accomplished much but you give me hope and strength to try even harder. So I will work hard, study and save up money to go see you in Japan.!!! I follow your post on G+ and sometimes leave messages in English, I hope that you have seen them…it would be great to see a few posts in English from you too! Anyway don’t loose hope ever and keep tryin to accomplish your dreams and I will do what I can to help you get there!!!! Ps:Maybe we will have Team Nozawa sometime in the future! Hi Rena, I think you are pretty awesome being the first foreign exchange to AKB! You are in a very special role that not many others can talk about, so have confidence in yourself! There is literally no-one else in your position to compare yourself to so I hope you can enjoy your time in AKB with few worries. You are young, have a new best friend in Hillary (who is awesome by the way, please tell her that) and the world is always interested in a girl with linguistic talents like yours. There is literally a world of options for you out there if you keep working on your language skills, I really hope you would keep practicing, stay healthy and really wow the Japanese! I hope as JKT48 representative you can get into janken senbatsu! well, nuff said, soo…. Ganba rena!! Apa kabar? Gimana persiapan debut theater Oshima team K nya? Mudah-mudahan lancar dan performance kamu disukai oleh fans Jepang. Semoga dengan bergabungnya kamu di AKB bisa mengembangkan talenta kamu sebagai Idol. Bawa nama baik JKT yaa! Kamu jangan takut. We will never forget you. Because you’re our beloved Renakkuma who always Joyful, Kawaii, and Try to be the Best! Haloo renaa! selamat ya kamu akhirnya bisa show disana dengan akb48.semua senang rena bisa sukses disana,tapi jangan lupa pulang ke Indonesia karena semua kangen kamu..semoga disana bisa senang dan sukses ya!Jangan lupa yang di Indonesia juga rena! kami menunggumu terus..SEMANGAT! I’m not late right for make a project for renachan? every step you take, every choice you made is your way to be wiser and wiser. Your family, your friends, your fans are not you, be free to choose any choice for your own happiness, because this is your life. Even you are an idol, be free to live! Kepercayaan diri tidak dapat dipelajari melainkan didapatkan saat anda BERANI MATI menghadapi rasa takut & IKHLAS menerima hasil. Renaa-chaaan~!!! aapa kabar? baik kan? aku harap kamu disana baik2 aja yah dan selalu semangat! Rena, apa kabar? aku sangat kangen! kangen lihat kamu perform di TV Indonesia, Good luck ya di AKB48 . Kita gabakal ngelupain kamu kok! kita selalu support kamu walaupun dari jauh! kamu sering-sering buka twitter fanbase indonesia ya! ( @Rena_issance @Renaissance_ID @Renaissance_JKT ) . Selalu beri kabar kita ya! banyak-banyak share foto yaa kalau bisa! Love you Rena! we miss you! GANBARENA–! Selamat ya rena sudah masuk oshima team K AKB48 jangan mau kalah sama, nanti pas handshake event 3rd Single JKT48 Kamu jangan sampai telat lagi kayak kemaren ya! hehe!! MISS U SO MUCH!!!! Haloo Rena ^^ semoga kamu seneng ya di AKB48 hehe, hmm jangan pernah lupa juga ya sama JKT48 dan fans kamu di Indonesia :’) pokoknya semangat terus deh buat Rena sukses yaa.. Ganbarenaaa!! Halo rena! Apa kabar? Semoga baik-baik aja disana. Oh iya sebentar lagi kamu ikut theater team K ya?. Selamat ya, mudah-mudahan di hari pertama kamu di theater AKB lancar ya. Dan di tunggu ya theaternya di jakarta :D. Semoga theater pertamamu menyenangkan GANBARENA!!! Halo Rena, apakabar? mudah mudahan rena selalu dalam keadaan sehat ya.Senang ketika dengar kabar kalau rena bakal debut di teater AKB,Semangat ya Rena ingat semua orang mendukung kamu, berikan penampilan yang terbaik ya. GANBARENA!!! Halo Renaaa!!! selamat ya udah masuk ke AKB48 tim K, sebenarnya agak sedih karena Rena harus ninggalin Indonesia dan pergi ke jepang, padahal belum sempat ke theater buat ngeliat Rena, Rena jangan sampe lupa sama Indonesia ya, karena fans Rena di Indonesia juga gak bakal ngelupain Rena. sukses ya buat debutnya bersama AKB48, semoga Rena sukses terus baik di JKT48 maupun di AKB48. GANBARENA!!!!! Hi, Rena. I don’t know if you remember me or not, but I hope you do. To be honest, I didn’t want to write this short letter to you because I want to watch your AKB48 theater performance and deliver my message to you personally. However, I don’t think I can make it there in such a short notice, so with this letter I want congratulate you for making it into Team K. It’s going to be a new experience for you, but I know that you have the potential to be successful. Be yourself, be that hard-working girl, be the Rena that I know. Yes, I am sad that I can’t see you that often now, but I want you to know that I will always support you from here. We love you, Rena. Together, we will always shout it out loud for you: MINNA~ GANBARENA! Jovi, unfortunately, your message is a little bit too long and can’t fit the letter to be printed according to Anon. Any shorter message one? Thanks! Halo Rena! Apa kabar? semoga baik – baik saja ya disana. Oh iya tanggal 9 kamu ada theater di AKB ya?. Wah semoga sukses ya show pertamanya di AKB. Tampilkan penampilan terbaik kamu Ya!. Oh iya di tunggu juga Theaternya di Jakarta. Aku pengen denger suara kamu lagi, liat kamu lagi di RKJ. Jadi cepat ke Jakarta ya!!. Oke,segini dulu ya Surat dari aku semoga dengan surat ini kamu tambah semangat buat theater pertamanya. Dadah.. GANBARENA!! Rena, congratulation for your theater debut. Keep healthy and energic! We all here always pray for your good. And remember, do not push yourself too hard because it will bring the bad things to you. If you are tired, rest. Remember that your life is not only your idol life but remember the other side of your life too, okay? You are not alone, we all here are with you…. Hei Rena, bagaimana kabarnya di Jepang? Selamat ya buat debut pertamanya di theater AKB, nggak sabar deh denger cerita dari kamu yang perform disana. Pokoknya semangat ya!!! Oh iya, kapan mau pulang ke Indonesia lagi? Kita disini udah kangen mau liat kamu perform lagi. Maybe more than 2 years i know and following JKT48, and as long as that i never get chance to come in JKT48 Teather to meet you Rena, my home is so far in East Java Blitar. One thing why JKT48 is so unique is because ur contribution there. on First debut you are one and only Japanese Member and you couldn’t speak Indonesian fluently, Do you remember. He.he so proud of you, although you part of AKB now you never forgote JKT48, i saw on Twitter you used Kebaya on Janken Turnament, and it’s so cool. Ganbarenaaaa, Achieve ur Dream in AKB48, I wait your new single with AKB48. Sebagai penutup aku kasih riddle juga.. hehe.. Rena masih ingat kan? Ogenki desu ka? Baik-baik aja, kan? Aku Nadhira. Umurku sebelas tahun. Iya, aku kelas 6 Sekolah Dasar (>-<) Aku tinggal di Yogyakarta. Ini pertama kalinya aku nulis fanletter. Selamat ya sudah masuk Team K. Di Jepang menyenangkan, kan? Fans Indonesia kangen banget, lho sama kamu. Terutama aku..
Pertama kali aku dengar kamu pindah ke AKB48 itu rasanya campur aduk~ Sedih, senang, bangga, tapi sedikit kecewa. Soalnya kamu itu oshimen pertama aku. Aku terus berdoa semoga kamu baik-baik aja disana. Oh ya, waktu itu aku juga lihat video kamu di theater AKB48. Kamu terlihat senang sekali^^ Melihat kamu senang, aku juga ikut senang. sorry, think this letter its too long. Ogenki desu ka? Baik-baik aja, kan? Aku Nadhira. Umurku sebelas tahun. Iya, aku kelas 6 Sekolah Dasar, Aku tinggal di Yogyakarta. Ini pertama kalinya aku nulis fanletter. Selamat ya sudah masuk Team K.Di Jepang menyenangkan, kan? Fans Indonesia kangen banget, lho sama kamu. Terutama aku .Oh ya, waktu itu aku juga lihat video kamu di theater AKB48. Kamu terlihat senang sekali^^ Melihat kamu senang, aku juga ikut senang. Aku dan lainnya di Indonesia akan selalu mendukung kamu. Berusahalah, Rena! Jaga kesehatanmu, jangan sampai sakit. Jangan lupa dengan kami disini, ya. Tunjukkan apa yang kamu bisa kepada mereka semua! Senang sekali pada kesempatan ini aku bisa mengirim pesan untuk Rena, walau keberadaan Rena sekarang di Jepang. Walaupun telah terpisah jarak beribu-ribu kilometer tidak menghalangi semangatku untuk terus mendukung Rena. Aku sangat penasaran dengan penampilan Shonichi Rena di teater AKB48 bersama Oshima Team K pada hari Rabu besok (09/10). Semoga saja aku bisa mendapatkan link streaming untuk bisa menyaksikan perform Rena pada saat itu. Jangan ragu menampilkan performa terbaikmu, karena yakinlah bahwa kami fans dari Indonesia selalu mendukungmu. GanbaRena!